MidwestHR’s 180 Initiative returned to Almost Home Kids in May to assist with a yard clean-up and planting volunteer event. Our team brought flowers to brighten up the yard and helped clean out the area for the kids and families to enjoy. Since the patients spend most of their time indoors to receive care and treatment, Almost Home Kids strives to give their patients an opportunity to be outside. Almost Home Kids provides a transitional home for children who have recently been released from the hospital, but are waiting to move back home. These patients need a place to stay that has the functionality of a hospital while their own homes are being safely equipped for their medical needs. Furthermore, the child’s caretakers are trained on operating these new devices, as well as learning new techniques for exercise and playtime to educate their children despite their restricted capabilities. Almost Home Kids makes efforts to ensure their patients are receiving the best treatment and their families are prepared for this new part of their lives. The 180 Initiative event at Almost Home Kids was a huge success and a very rewarding experience for our team. 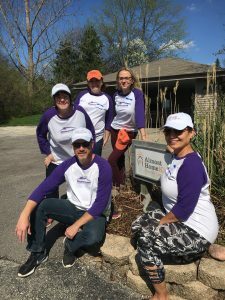 MidwestHR had recently conducted a donation event to replenish the supplies in the transitional home, but we were excited to help them in a different aspect. Hopefully, the 180 Initiative program will continue volunteering at Almost Home Kids in the future! With nearly 15 years of accounting experience, Cathy joined MidwestHR as a Staff Accountant 2017. 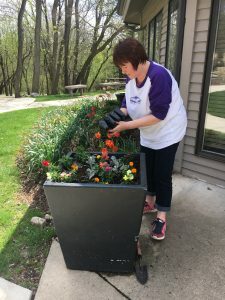 When not working on financials, Cathy is a member of the 180 Initiative Committee and is a large contributor to MidwestHR’s “Giving Back” initiatives. Blogging about all things related to the PEO industry.